Terrorist acts frequently have a political purpose. Some official, governmental definitions of terrorism use the criterion of the illegitimacy or unlawfulness of the act. to distinguish between actions authorized by a government (and thus "lawful") and those of other actors, including individuals and small groups. For example, carrying out a strategic bombing on an enemy city, which is designed to affect civilian support for a cause, would not be considered terrorism if it were authorized by a government. This criterion is inherently problematic and is not universally accepted, because: it denies the existence of state terrorism. An associated term is violent non-state actor. Terrorism is most common in nations with intermediate political freedom, and it is least common in the most democratic nations. one study suggests that suicide attacks may be an exception to this general rule. Evidence regarding this particular method of terrorism reveals that every modern suicide campaign has targeted a democracy–a state with a considerable degree of political freedom. The study suggests that concessions awarded to terrorists during the 1980s and 1990s for suicide attacks increased their frequency. There is a connection between the existence of civil liberties, democratic participation and terrorism. According to Young and Dugan, these things encourage terrorist groups to organize and generate terror. Terrorist acts throughout history have been performed on religious grounds with the goal to either spread or enforce a system of belief, viewpoint or opinion. The validity and scope of religious terrorism is limited to an individual's view or a group's view or interpretation of that belief system's teachings. State terrorism has been used to refer to terrorist acts committed by governmental agents or forces. This involves the use of state resources employed by a state's foreign policies, such as using its military to directly perform acts of terrorism. Professor of Political Science Michael Stohl cites the examples that include the German bombing of London, the Japanese bombing of Pearl Harbor, the British and American firebombing of Dresden, and the U.S. atomic bombings of Hiroshima and Nagasaki during World War II. He argues that "the use of terror tactics is common in international relations and the state has been and remains a more likely employer of terrorism within the international system than insurgents." He cites the first strike option as an example of the "terror of coercive diplomacy" as a form of this, which holds the world hostage with the implied threat of using nuclear weapons in "crisis management" and he argues that the institutionalized form of terrorism has occurred as a result of changes that took place following World War II. In this analysis, state terrorism exhibited as a form of foreign policy was shaped by the presence and use of weapons of mass destruction, and the legitimizing of such violent behavior led to an increasingly accepted form of this behavior by the state. Christian terrorism comprises terrorist acts by groups or individuals who profess Christian motivations or goals. Christian terrorists justify their violent tactics through their interpretation of the Bible, in accordance with their own objectives and world view. These interpretations are typically different from those of established Christian denominations.These terrorist acts can be committed against other Christian denominations, other religions, or a secular government group, individuals or society. Christianity can also be used cynically by terrorists as a rhetorical device to achieve political or military goals.Christian terrorist groups include paramilitary organizations, cults and loose collections of people that might come together to attempt to terrorize another group. Some groups also encourage terrorist acts by unaffiliated individuals. The paramilitary groups are typically tied to ethnic and political goals as well as religious ones and many of the other groups have religious beliefs at odds with conventional Christianity. Counter-terrorism (also spelled counterterrorism) incorporates the practice, military tactics, techniques, and strategy that government, military, law enforcement, business, and intelligence agencies use to combat or prevent terrorism. Counter-terrorism strategies include attempts to counter financing of terrorism. If terrorism is part of a broader insurgency, counter-terrorism may employ counter-insurgency measures. The United States Armed Forces use the term foreign internal defense for programs that support other countries in attempts to suppress insurgency, lawlessness, or subversion or to reduce the conditions under which these threats to security may develop. collateral damage, including the infliction of incidental damage to non-combatant targets during an attack on or attempting to attack legitimate targets in warThere are many reasons for the failure to achieve universal consensus regarding the definition of terrorism. In a briefing paper for the Australian Parliament, Angus Martyn stated that "[t]he international community has never succeeded in developing an accepted comprehensive definition of terrorism. During the 1970s and 1980s, the United Nations attempts to define the term foundered mainly due to differences of opinion between various members about the use of violence in the context of conflicts over national liberation and self-determination." These divergences have made it impossible to conclude a Comprehensive Convention on International Terrorism that incorporates a single, all-encompassing, legally binding, criminal-law definition of terrorism. In the meantime, the international community adopted a series of sectoral conventions that define and criminalize various types of terrorist activities. In addition, since 1994, the United Nations General Assembly has condemned terrorist acts using the following political description of terrorism: "Criminal acts intended or calculated to provoke a state of terror in the general public, a group of persons or particular persons for political purposes are in any circumstance unjustifiable, whatever the considerations of a political, philosophical, ideological, racial, ethnic, religious or any other nature that may be invoked to justify them." "Terrorism expert Walter Laqueur also has counted over 100 definitions and concludes that the 'only general characteristic generally agreed upon is that terrorism involves violence and the threat of violence.' Yet terrorism is hardly the only enterprise involving violence and the threat of violence. So does war, coercive diplomacy, and bar room brawls". Eco-terrorism is an act of violence committed in support of ecological or environmental causes, against people or property.The United States Federal Bureau of Investigation defines eco-terrorism as "...the use or threatened use of violence of a criminal nature against innocent victims or property by an environmentally-oriented, subnational group for environmental-political reasons, or aimed at an audience beyond the target, often of a symbolic nature." The FBI credited eco-terrorists with US$200 million in property damage between 2003 and 2008. A majority of states in the US have introduced laws aimed at penalizing eco-terrorism.Eco-terrorism is a form of radical environmentalism that arose out of the same school of thought that brought about deep ecology, ecofeminism, social ecology, and bioregionalism. "Eco-terrorism" is a controversial term.Some "eco-terrorists" are people fighting to preserve their environment with the belief that they are preserving their existence. Examples of such "ecoterrorists" include tribal ethnic minorities such as the Waorani. The FSB is mainly responsible for internal security of the Russian state, counterintelligence, and the fight against organized crime, terrorism, and drug smuggling, whereas overseas espionage is the primary responsibility of the Russian Foreign Intelligence Service, successor to the KGB's First Directorate, as well as the GRU, a body within the Russian Ministry of Defence. However, the FSB's FAPSI conducts electronic surveillance abroad. All law enforcement and intelligence agencies in Russia work under the guidance of the FSB, if necessary.The FSB employs about 66,200 uniformed staff, including about 4,000 special forces troops. It also employs about Border Service of the 160,000–200,000 border guards.Under Article 32 of the Federal Constitutional Law On the Government of the Russian Federation, The FSB answers directly to the RF president and the Director of FSB, while a member of the RF government which is headed by the Chairman of Government, reports to the president only; the Director also, ex officio, is a permanent member of the Security Council of Russia presided over by the president and chairman of the National Anti-terrorism Committee of Russia. The Global War on Terrorism Service Medal (GWOT-SM) is a military award of the United States Armed Forces which was created through Executive Order 13289 on 12 March 2003, by President George W. Bush. The medal recognizes those military service members who have supported operations to counter terrorism in the War on Terror from 11 September 2001, to a date yet to be determined. Islamic terrorism, Islamist terrorism or radical Islamic terrorism is defined as any terrorist act, set of acts or campaign committed by groups or individuals who profess Islamic or Islamist motivations or goals. Islamic terrorists justify their violent tactics through their own interpretation of the Quran and Hadith. The motivation for Islamic terrorism in part comes from the idea of Islamic supremacy which is encapsulated in the formula, "Islam is exalted and nothing is exalted above it. "The highest numbers of incidents and fatalities caused by Islamic terrorism occur in Iraq, Afghanistan, Nigeria, Pakistan and Syria. In 2015 four Islamic extremist groups were responsible for 74% of all deaths from terrorism: ISIS, Boko Haram, the Taliban and Al-Qaeda, according to the Global Terrorism Index 2016. In recent decades, such incidents have occurred on a global scale, affecting not only Muslim-majority states in Africa and Asia, but also several other countries, including those within the European Union, Russia, Australia, Canada, Israel, India, the United Kingdom and the United States. Such attacks have targeted Muslims and non-Muslims. In a number of the worst-affected Muslim-majority regions, these terrorists have been met by armed, independent resistance groups, state actors and their proxies, and elsewhere by condemnation coming from prominent Islamic figures. This is a list of designated terrorist groups by national governments, former governments, and inter-governmental organizations, where the proscription has a significant effect on the group's activities. Many organizations that are accused of being a terrorist organization deny using terrorism as a military tactic to achieve their goals, and there is no international consensus on the legal definition of terrorism. Some organisations have multiple wings or components, one or more of which may be designated as terrorist while others are not. This listing does not include unaffiliated individuals accused of terrorism, which are considered under lone wolf terrorism. This list also excludes groups which might be widely considered terrorist, but who are not officially so designated according to the criteria specified above. This list is not all inclusive. For more inclusive lists, including people, entities (corporations), and specific vehicles, refer to lists under Process of designation. There are near about 210 recognised terrorist organisations. The following is a list of terrorist incidents that have not been carried out by a state or its forces (see state terrorism and state-sponsored terrorism). Assassinations are listed at List of assassinated people. A Lone Terrorist or Lone Wolf, is someone who prepares and commits violent acts alone, outside of any command structure and without material assistance from any group. They may be influenced or motivated by the ideology and beliefs of an external group and may act in support of such a group. In its original sense, a "lone wolf" is an animal or person that generally lives or spends time alone instead of with a group.Observers note the attacks are a relatively rare type of terrorist attack but have been increasing in number, and that it is sometimes difficult to tell whether an actor has received outside help and what appears to be a lone wolf attack may actually have been carefully orchestrated from outside. Religious terrorism is terrorism carried out based on motivations and goals that may have a predominantly religious character or influence. In the modern age, after the decline of ideas such as the divine right of kings and with the rise of nationalism, terrorism has more often been based on anarchism, and revolutionary politics. Since 1980, however, there has been an increase in terrorist activity motivated by religion.Former United States Secretary of State Warren Christopher has said that terrorist acts in the name of religion and ethnic identity have become "one of the most important security challenges we face in the wake of the Cold War." However, the political scientists Robert Pape and Terry Nardin, the social psychologists M. Brooke Rogers and colleagues, and the sociologist and religious studies scholar Mark Juergensmeyer have all argued that religion should only be considered one incidental factor and that such terrorism is primarily geopolitical. Saffron terror is a neologism used to describe acts of violence motivated by Hindu nationalism, usually perpetrated by members, or alleged members, of Hindu nationalist organisations like Rashtriya Swayamsevak Sangh (RSS) or Abhinav Bharat. The term comes from the symbolic use of the saffron colour by many Hindu nationalist organisations. The September 11 attacks (also referred to as 9/11) were a series of four coordinated terrorist attacks by the Islamic terrorist group al-Qaeda against the United States on the morning of Tuesday, September 11, 2001. The attacks killed 2,996 people, injured over 6,000 others, and caused at least $10 billion in infrastructure and property damage. Additional people died of 9/11-related cancer and respiratory diseases in the months and years following the attacks. State terrorism refers to acts of terrorism conducted by a state against foreign targets or against its own citizens. A suicide attack is any violent attack in which the attacker accepts his own death as a direct result of the method used to harm, damage or destroy the target. Suicide attacks have occurred throughout history, often as part of a military campaign such as the Japanese kamikaze pilots of World War II, and more recently as part of terrorist campaigns, such as the September 11 attacks. 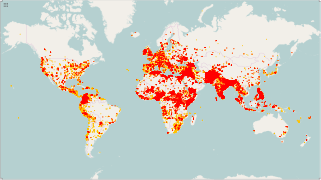 While there were few, if any, successful suicide attacks anywhere in the world from the end of World War II until 1980, between 1981 and September 2015, a total of 4,814 suicide attacks occurred in over 40 countries, killing over 45,000 people. During this time the global rate of such attacks grew from an average of three a year in the 1980s, to about one a month in the 1990s, to almost one a week from 2001 to 2003, to approximately one a day from 2003 to 2015.Suicide attacks tend to be more deadly and destructive than other terror attacks because they give their perpetrators the ability to conceal weapons, make last-minute adjustments, and because they dispense with the need for remote or delayed detonation, escape plans or rescue teams. 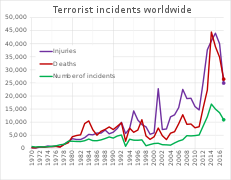 They constituted only 4% of all terrorist attacks around the world over one period (between 1981 and 2006), but caused 32% of all terrorism-related deaths (14,599). Ninety percent of those attacks occurred in Afghanistan, Iraq, Israel, the Palestinian territories, Pakistan, and Sri Lanka. Overall, as of mid-2015 about three-quarters of all suicide attacks occurred in just three countries: Afghanistan, Pakistan, and Iraq.Suicide attacks have been described as a weapon of psychological warfare to instill fear in the target population, a strategy to eliminate or at least drastically diminish areas where the public feels safe, and the "fabric of trust that holds societies together", as well as demonstrate the lengths to which perpetrators will go to, to achieve their goals.The motivation of suicide attackers varies. Kamikaze acted under military orders and were motivated by obedience and nationalism. Before 2003, most attacks targeted forces occupying the attackers' homeland, according to analyst Robert Pape. Anthropologist Scott Atran states that since 2004 the overwhelming majority of bombers have been motivated by the ideology of Islamist martyrdom. Terrorism in India, according to the Home Ministry, poses a significant threat to the people of India. Terrorism found in India includes ethno-nationalist terrorism, religious terrorism, left wing terrorism and narco terrorism.A common definition of terrorism is the systematic use or threatened use of violence to intimidate a population or government for political, religious, or ideological goals.The regions with long term terrorist activities have been Jammu and Kashmir, east-central and south-central India (Naxalism) and the Seven Sister States. In August 2008, National Security Advisor M K Narayanan has said that there are as many as 800 terrorist cells operating in the country. 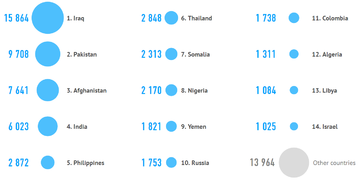 As of 2013, 205 of the country’s 608 districts were affected by terrorist activity. Terror attacks caused 231 civilian deaths in 2012 in India, compared to 11,098 terror-caused deaths worldwide, according to the State Department of the United States; or about 2% of global terror fatalities while it accounts for 17.5% of global population.Media reports have alleged and implicated terrorism in India to be sponsored by Pakistan, particularly through its Inter-Services Intelligence (ISI). In 2012, the US accused Pakistan of enabling and ignoring anti-India terrorist cells working on its soil; however, Pakistan has denied its involvement. In July 2016, Government of India released data on a string of terror strikes in India since 2005 that claimed 707 lives and left over 3,200 injured.In mid-September 2018 Police in India have announced they have arrested a terrorist from the Hizbul Mujahideen group in the city of Kanpur, who wanted to attack on Ganesh Chaturthi. The War on Terror, also known as the Global War on Terrorism, is an international military campaign that was launched by the United States government after the September 11 attacks against the United States. The naming of the campaign uses a metaphor of war to refer to a variety of actions that do not constitute a specific war as traditionally defined. U.S. president George W. Bush first used the term "war on terrorism" on 16 September 2001, and then "war on terror" a few days later in a formal speech to Congress. In the latter speech, George Bush stated, "Our enemy is a radical network of terrorists and every government that supports them." The term was originally used with a particular focus on countries associated with al-Qaeda. The term was immediately criticised by such people as Richard B. Myers, chairman of the Joint Chiefs of Staff, and more nuanced terms subsequently came to be used by the Bush administration to publicly define the international campaign led by the U.S.; it was never used as a formal designation of U.S. operations in internal government documentation.U.S. President Barack Obama announced on 23 May 2013 that the Global War on Terror was over, saying the military and intelligence agencies will not wage war against a tactic but will instead focus on a specific group of networks determined to destroy the U.S. On 28 December 2014, the Obama administration announced the end of the combat role of the U.S.-led mission in Afghanistan. However, the unexpected rise of the Islamic State of Iraq and the Levant (ISIL) terror group—also known as the Islamic State of Iraq and Syria (ISIS)—led to a new operation against terror in the Middle East and South Asia, Operation Inherent Resolve. Criticism of the War on Terror focused on morality, efficiency, economics; some, including later president Barack Obama, objected to the phrase itself as a misnomer. The notion of a "war" against "terrorism" has proven contentious, with critics charging that it has been exploited by participating governments to pursue long-standing policy/military objectives, reduce civil liberties, and infringe upon human rights. Critics also assert that the term "war" is not appropriate in this context (much like the term "War on Drugs") since there is no identifiable enemy and it is unlikely that international terrorism can be brought to an end by military means.